We are so excited to have reached 300 members on Crafter's Digital Art Center. To celebrate, we are going down memory lane and will show you some of our favorite projects made with Guylou's Inimitability Digistamps. We invite you to hop through the DT blogs and leave comments and come back here to leave your name, email (will not be displayed) and to tell us which is your favorite GI digi in the Linky below. A random winner will be selected from the entries and will win this RAK and her favorite Guylou's Inimitability Digistamp. Guylou’s Inimitability is where you will start and end the blog hop and if you have come here from Gina's blog then you are going in the right direction! If not, then please start at Guylou’s Inimitability or refer to the blog hop list at the bottom of this post to get you on the right track. The hop will be open today from 9:00 am to 9:00pm EST. When you have completed the blog hop, please enter your name, email (will not be displayed) and tell us which is your favorite Guylou's Inimitability Digistamp in the Linky below. It was kind a hard to choose a favorite image but here are my cards with my first purchased images. This image is me during the weekend. I'm always surprised by the amount of laundry I have. I really can not tell why I love Leah but she has such a friendly face. Se is suitable for so many ocassions. I wish you all a nice weekend and enjoy hopping! Carmen, I love both cards. They both have a soft, feminine feel. So pretty!!! I love Leah myself. You are so right about her having a friendly face! LOL Great picks Carmen! Carmen, your cards are really gorgeous!! Great choices. I love all of your layering and your coloring is beautiful! Awesome cards as always.. I always love the super soft feel to your creations and your mad paper layering skills. Great choices. 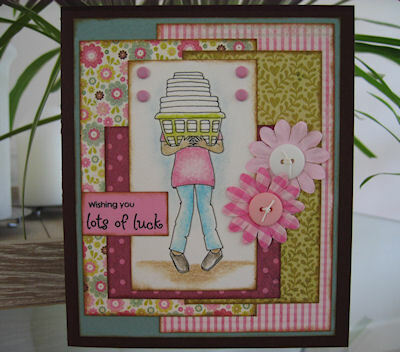 Oh Carmen - such soft sweet adorable colors and love all the little details that make your cards fantastic. Love the fact that you always seem to add a lot of layers and yet it never seems "too much"...sheer work of genius. You have done a fabulous job with the coloring on these images....great choices for papers too!! Would hate to have to pick the one I like the best. Both are fabulous. 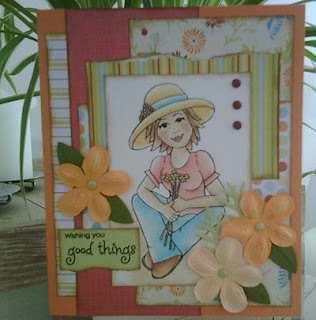 Love how you are able to use layering on your cards. Great job! Carmen, I always love how you manage to layer paper! I have yet to attempt it because I just don't have it! Beautiful cards! I love these cards. Great job. Carmen, thank you for sharing these wonderful creations. I love all the different styles and "textures" of the dp that you used...and the added embellishments...enough to accent the card, but not so much that it over takes the image! Awww my 2 favorites side by side. Thanks. Carmen - the soft look of your cards is just precious! Fabulous cards!! Thank you so much for being part of my DT and for making such beautiful cards with my digis. I am always amazed at your designs and the fantastic pp you use. You rock! !